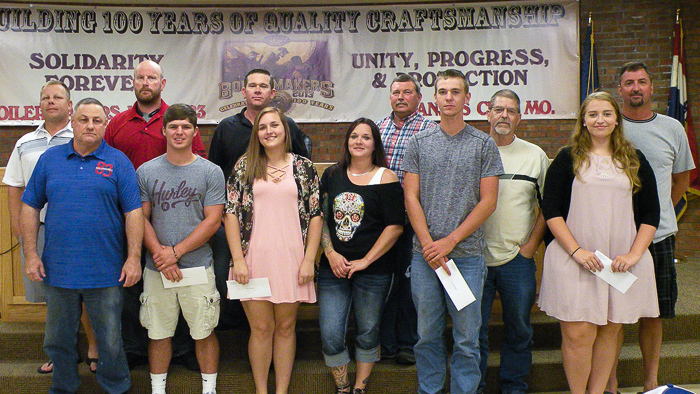 Local 83 scholarship winners, left to right: Trustee Chairman Casey Jensen; President Robbie Grant; BM-ST Scot Albertson; Cody Anschutz, son of Wade Anschutz; Recording Secretary Zach Hayes; Marissa Riddle, daughter of Lori Manroe; Lori Manroe; Inspector John Seward; Garrett Helmich, son of Billie Helmich; Billie Helmich; Jordyn Corn, daughter of Jeff Kuzelka; and Jeff Kuzelka. Not pictured: Jordan Elam, son of Richard Elam. Chaska Vilchez, daughter of Local 146 (Edmonton, Alberta) member Jose Mijail Vilchez, is a graduate of Pinetree Secondary School and is attending the University of Alberta. She’s majoring in science, specializing in molecular genetics. She hopes to become a doctor. Local 83 (Kansas City, Missouri) awards scholarships to five dependents of local lodge members. Left to right: Trustee Chairman Casey Jensen; President Robbie Grant; BM-ST Scot Albertson; Cody Anschutz, son of Wade Anschutz; Recording Secretary Zach Hayes; Marissa Riddle, daughter of Lori Manroe; Lori Manroe; Inspector John Seward; Garrett Helmich, son of Billie Helmich; Billie Helmich; Jordyn Corn, daughter of Jeff Kuzelka; and Jeff Kuzelka. Not pictured: Jordan Elam, son of Richard Elam. FOUR DEPENDENTS OF Local 105 (Chillicothe, Ohio) members received a $1,000 Don Storey Memorial Scholarship earlier this year. They were Caleb Carter, son of Carty Carter; Caleb and Jacob Cyrus, sons of Christian Cyrus; and Haley Valandingham, step-daughter of Steve Smith. JACOB MOON, SON of Local 14 (Chattanooga, Tennessee) member Timothy Moon, is the recipient of the lodge’s 2017 scholarship award. Moon is attending Tennessee Tech University and majoring in civil engineering. LOCAL 13 (PHILADELPHIA) selected winning applicants for nine academic scholarships and two Jeffrey C. Davis Awards (including one vocational and one graduate). Both awards are funded by the family of apprentice Jeffrey C. Davis (who died in a 2002 job-site explosion). The vocational award will be given over a period of two years at $600 per semester for four semesters. The graduate award is a one-time award of $2,400. The Local 13 scholarship committee does not release the names of scholarship winners for publication.